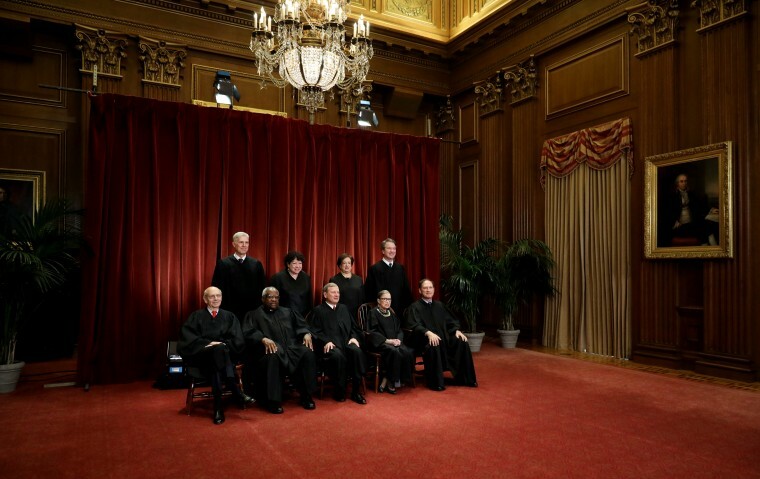 Steve Vladeck: Why does the Supreme Court have nine justices? And why can't Democrats add more? Steve Vladeck Why does the Supreme Court have nine justices? And why can't Democrats add more? The Constitution doesn't prevent Congress from court-packing. But such a move would irrevocably erode the court's legitimacy. Even most lawyers have probably never heard of the Judiciary Act of 1869, which became law 150 years ago today. But this obscure statute, among other things, adjusted the number of seats on the Supreme Court to its now familiar total of nine — a total that Congress hasn’t touched since. On this, the 1869 act’s sesquicentennial, it’s worth reflecting on how we ended up with nine justices — and why recent proposals that Democrats should expand the size of the court when that party is next in control of both chambers of Congress and the White House are dangerously myopic. Recent proposals that Democrats should expand the size of the court are dangerously myopic. The Constitution, perhaps surprisingly, says nothing about how many justices should serve on the Supreme Court. The text contemplates at least one — a chief justice — to preside over a president’s impeachment trial. But otherwise, the Founders left the size of the court to Congress, which tweaked the number of seats seven times over its first 80 years. In 1801, for example, lame-duck Federalists tried to deny incoming President Thomas Jefferson the chance to fill a seat that was expected to soon be vacant by reducing the court’s size from six justices (the original complement under the Judiciary Act of 1789) to five. But once Jefferson was sworn in, his partisans in the new Congress quickly restored the seat — and Jefferson filled it. As the nation expanded westward, Congress kept pace, adding seats to the Supreme Court each time it created new circuit courts of appeals — for the Seventh Circuit in 1807, the Eighth and Ninth Circuits in 1837 and the Tenth Circuit in 1863. Although the timing of the expansions was often dictated by politics, having one seat per circuit provided both an apolitical justification for the court’s size and a principle of geographic diversity among the justices, since the idea was that each seat would be filled by someone from a different circuit. But as part of its broader conflict with President Andrew Johnson, Congress reduced the number of seats on the court in 1866 from 10 seats to seven — decoupling the number of seats from the number of circuit courts of appeals. Although the 1869 act, enacted one month after the inauguration of President Ulysses S. Grant — Johnson’s successor — restored to nine both the number of circuits and Supreme Court seats, the episode set off alarm bells. Should Congress have the power to interfere with both the president — by changing the size of the court — and the court itself? Thus, when Congress next added a new circuit court in 1929, it left the size of the court unchanged. And when President Franklin Delano Roosevelt, relying on dubious claims about the justices’ health and pace of work, infamously proposed to increase the size of the court to 15 Justices in 1937, it was the pushback from his own party in Congress that largely killed the proposal. Should Congress have the power to interfere with both the president — by changing the size of the court — and the court itself? The concern that animated Democratic opposition to FDR’s “court-packing” plan is just as valid today: If Congress increases the size of the Supreme Court for transparently partisan political reasons, it would cement the idea the justices are little more than politicians in robes, and that the court is little more than an additional — and very powerful — arm through which partisan political power can be exercised. And although many Americans already hold this view of the court, court-packing for transparently partisan reasons would only make things worse, especially if it set a precedent for future Congresses to do the same. Indeed, if one of the most important justifications for an independent, un-elected judiciary is the ability to protect the rights of minorities against the tyranny of the majority, a court that is beholden to whichever party is currently in power would likely lack both the inclination and the legitimacy to stand up to the political branches. Indeed, that Congress has not revisited the size of the court in 150 years is a powerful testament to just how ingrained the norm of nine has become — and how concerned different political constituencies have been at different times about preserving the court’s power. To be sure, there are some who see the addition of two new seats to the court as a proportional response to hardball tactics by Republicans — first by holding open the seat vacated by Justice Antonin Scalia for nearly a year so that it could not be filled by President Barack Obama, and then by confirming Justice Brett Kavanaugh notwithstanding broader concerns about both the nominee and the president who nominated him. Not only do two wrongs not make a right, though, but once Congress gets back into the business of messing with the size of the court, it’s impossible to imagine it stopping. Thus, Democrats might expand the court to 11 seats in 2021, but nothing would stop Republicans from expanding the court to 15 when next they control both chambers of Congress and the White House — and so on. It would only be a matter of time before the court had 37 justices — and no legitimacy. To some, of course, destroying the legitimacy of the Supreme Court (especially the current court) is a feature, not a bug. So be it. But even those who don’t see their views represented among a majority of the current justices should have an interest in preserving the court’s long-term authority to check the political branches — authority that court-packing would necessarily, and irrevocably, erode.